My life is like a really messy kitchen. The sink is filled to the brim with full-time school, full-time work, and marathon training. The cabinets are stuffed with making time for my husband and taking care of my poor home which always seems to end up last on the list. Adding a hobby to the mix is daunting at times, but I would not have it any other way. I love Grubarazzi. She’s a friend of mine. Like an extremely selfish but loveable BFF. During my first year of food blogging I was certain of very few things. I wanted to share my recipes, fiddle with my camera, write, and soak in all of the information I could about all of the above. What I didn’t want to deal with was a “vision”. It felt like a nuisance to have a reason for writing this blog other than simply doing what I love. Can’t a woman just cook? I chucked the food blogging rule book out the window on plenty of occasions opting for simplicity in its place. Unfortunately, the rule book is there for a reason. After a year I realize a vision is necessary to keep the passion alive. So here I am being all normal and stuff. Visitors to Grubarazzi might notice many of the recipes typically lack a few ingredients including dairy, shellfish, strawberries, and gluten. I am one of those “poor souls” who hit their late 20’s and starting feeling more sick than healthy. There were times I was so under the weather I couldn’t move. A few years ago I went to an allergist convinced I was simply allergic to my cat and learned the sad truth: I was just allergic to everything else. Being a “foodie” with food allergies is sort of like being a leper. Will I be laughed out of culinary school? Can I go to my favorite restaurants without the chefs I adore smashing plates in the kitchen because of my numerous requests? Can I still love food when food does not necessarily love me? I am coming to realize, slowly but surely, that I can! Instead of hiding my food allergies I am learning to embrace them. There are millions of people like me, and I hope that we can grow, cook, and learn together. Over time this blog will become easier to navigate for those with allergies. Who knows, maybe Grubarazzi will become your selfish BFF, and a place where we can all learn to nurture our bodies in a way that satisfies our craving for great food and an even better life. 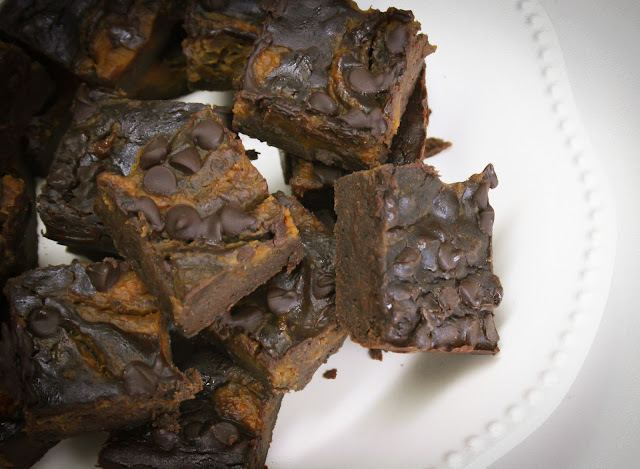 Let’s start with these delicious black bean brownies. My friend Megan is a wonderful baker who happens to have a gluten and dairy allergy as well. Every so often she will bring me a treat, and a few weeks ago she got me addicted to her brownies. The recipe below is basic and waiting for your special touch. For example, I added a swirl of sweetened pumpkin to the mix. You should try black pepper or cinnamon, chipotle, peanut butter, cream cheese, or frosting. You name it. The sky’s the limit! Preheat oven to 350 degrees F. Place parchment paper in a 8×8″ baking pan. This will be your security blanket to make sure the brownies don't stick to the pan!! In a small bowl mix together pumpkin, maple syrup, and cinnamon; set aside. Place all the brownie ingredients except chocolate chips in a food processor or blender and pulse thoroughly until smooth and well combined. Pour batter in the baking dish. Top with nuts (optional) and chocolate chips (seriously not optional). Gently dollop pumpkin, and with a knife create swirls on top of brownie mixture. Bake for 30-35 minutes or until the top is dry and edges begin to pull away from the baking dish. Cool completely before cutting. They are certainly healthier than the regular version...but they are even more intense in chocolate flavor. Can't beat that! These looks wonderful - I love your addition of pumpkin. I have a GF black bean brownie on my site that I call "Mexican" because I added cinnamon and cayenne. I'm a sucker for heat! So true, Laura! I am forced to be more creative. Cayenne in these brownies would be awesome. you know we have the love of all these heat in common. Great post and loving the pumpkin mapple swirl. I love your messy kitchen analogy - true here too. Who said blogging was easy - but isn't it worth it when you come up with a showstopper like these brownies! Gosh, I never put it all together! I'm sorry you have to deal with these allergies, but I'm GLAD you found out what was making you miserable. You will be a great resource for many who have the same issues...and your recipes are always tempting...even without gluten, dairy, etc. I'm so glad you decided to share these brownies - the black beans are so intriguing in desserts and I've been thinking I should give it a try. And I love the use of pumpkin. And regarding visions, I recently read an article about how successful folks (not just bloggers but athletes and others) learn to "play" and experiment more (rather than focusing on achieving results) which ultimately leads them to discover better methods to reach their goals, etc. Which is just a long way of saying that there seems to be some credence to going your own way and forgetting convention... Anyway, love your blog and this post and I'm featuring this post as part of Food Fetish Friday (with a link-back and attribution) and thanks for making me drool!